I've been a huge fan of ammonites (an extinct class of marine mollusc) practically forever. I have a small stash of cut and polished ammonite slabs that have made their way into many of my pieces over the years. Most of those pieces are pretty elaborate, so I thought it might be nice to have a smaller pendant to wear for casual occasions. I'm going outline the basic steps for this pendant, but you will find much more detailed step-by-step instructions for putting together a bead embroidered piece, including back stitch, edging brick stitch, and stack stitch can be found in the free first chapter of Every Bead Has a Story. Chapter two has instructions for stitching a peyote stitch bezel, and Chapter three teaches the square stitch bail. 1. The back of most ammonites is irregular, rough, and thick. 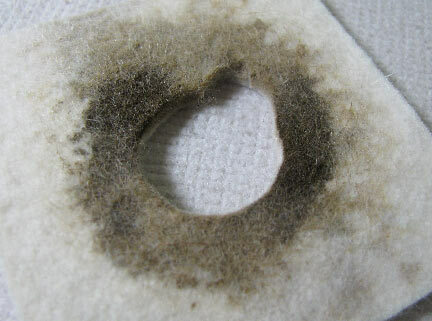 I took a piece of extra-thick wool felt and cut a small hole that would accommodate the parts of the back that stick out the most. 2. A little bit of brown acrylic paint will make it less likely that the backing will show through the beading, plus it helps a bit to stick down the fuzzies from the wool! 3. 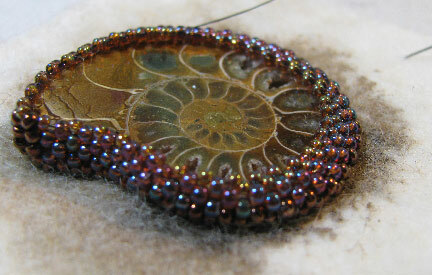 I stitched around the outline of the ammonite with size 11/0 seed beads, making sure to have an even number. 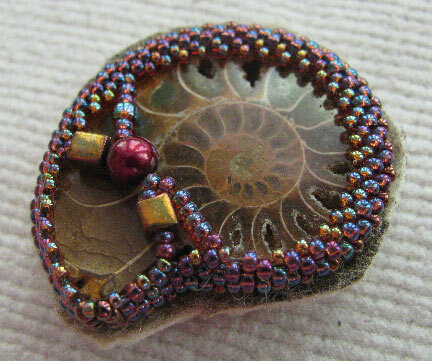 From that base, I stitched a peyote stitch bezel, ending with a final row of size 15/0 seed beads to cinch it in over the top of the fossil. You can barely see it, but on the left corner, I stitched a herringbone corner instead so that it would wrap nicely around that sharp turn. The instructions are at the link. 4. To give it a little added security, I stitched across the piece twice, intersecting in the middle. I'm pretty sure the bezel would have held the fossil in on its own, but I am happy to make sure! 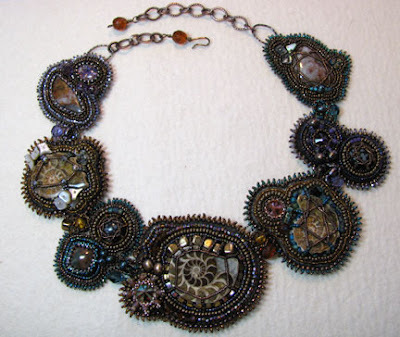 Plus, I think the extra Czech bead embellishment looks pretty. 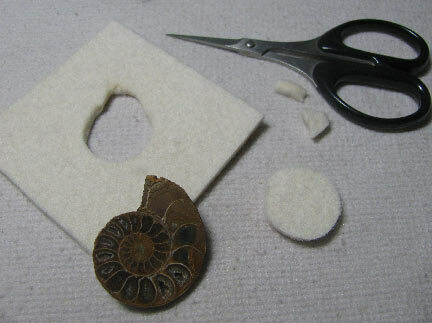 You can see that I've also clipped the thick felt (carefully!) around the outline, leaving enough room for one more row of seed beads. Next week I'll show you how to finish off this pendant. It's a little trickier than usual because of that thick felt! Hi Cindy! 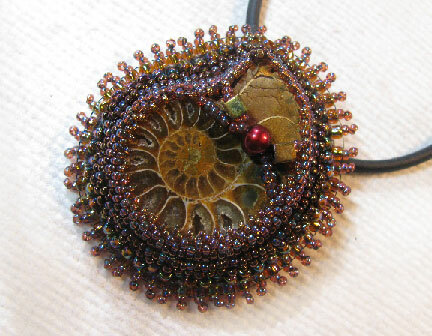 Both ammonite necklaces look very lovely! I made an ammonite necklace as well a while back: http://pin.it/ChBQOeZ I used some clay to even out the bottom of the ammonite, which worked really well! How clever! I went to see the finished piece, and I really love the color combo :-) Thanks for sharing it, Els. I can sure see why you treasure your ammonite slabs, Cyndi. The history and beauty are awesome. You do them justice with your beautiful bead embroidery.